HIGH POINT, N.C. - (March 20, 2018) — Showplace, a key destination for many Top 100 retailers, designers and buyers, will feature several new tenants and expanded showrooms on the exhibitor roster for spring High Point Market, April 14 – 18, 2018. More than 80 exhibitors are bringing new product to Showplace, offering a variety of design aesthetics and price points. 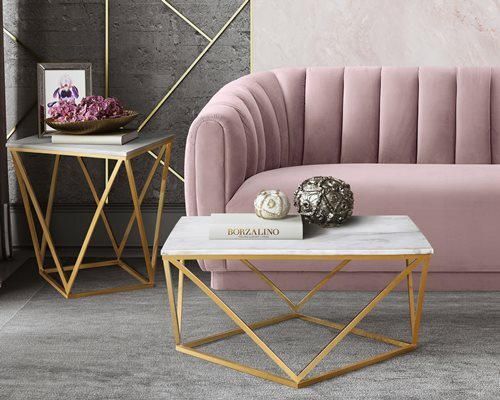 Several companies are making their Showplace debut during Spring Market including: Art Carpet, Bombay Company, Capris Furniture, Tov Furniture (pictured) and Three Birds Casual. Art Carpet manufactures woven area rugs of various constructions, sizes and qualities in a one million-square-foot state-of-the-art facility outfitted with 26 high-tech weaving machines. The company serves six continents and exports to more than 50 countries all over the world. According to officials, Bombay started as a mail order company in New Orleans in 1978, eventually growing to be a “much-loved purveyor of furnishings and gifts.” At Market, buyers in the Bombay showroom will find upholstery and case goods, wall décor, accent furniture, dining furniture and storage. The product list at Tov Furniture includes accent furniture, antiques and reproductions, bar and dining pieces, lamps and lighting, rugs and upholstery. Members of the Tov team state that they focus on bold, cutting-edge designs that are not only in-step with latest fashions, but that also set new fashion trends and offer a perfect balance between style, comfort, quality and price. A new outdoor source for Showplace, Three Birds Casual offers products that allow consumers to bring indoor lifestyles to outdoor settings. From sectionals and sofas to dining tables and umbrellas, Three Birds Casual helps retailers and designers develop outdoor living showcases that translate into almost any backyard. In addition to the new showrooms, several companies are relocating to or expanding within Showplace. These companies include: The Bramble Co. (SHOW 1525/1550/1650); Capris Furniture (SHOW 3555/3603); CDI International (SHOW 2500); and GTR Leather (SHOW 3605). Surya (SHOW 4100) is hosting several events in the company’s showroom during Spring Market. The events include: Candice Olson Talks Lighting, Saturday, April 14, 2 p.m.; The Guide to Area Rugs (0.1 CEU), Sunday, April 15, 10 a.m.; Spring Celebration, Sunday, April 15, 6 p.m.; and eDesign: The Online Interior Design Movement, Monday, April 16, 10 a.m.
Sat.-Tues. 5:00-7:00pm, on the 3rd Floor Balcony, with complimentary beer, wine and passed hors d'oeuvres.